Very pretty - I actually love the colour combo! The embossing looks so decadent! Ohhhh!!! I am loving this card and all it's splendor! Especially that hat pin you used with beads and ribbon! Lovely! Random??? naaaaaahhh :) I think it's beautiful. The embossing - the hat pin - the wee bit of sparkle...it's all just so well put together. Thanks so much for playing along with us -- I hope you'll be back again! Glad you took the time to link your project -- it's lovely!! Beautiful card. 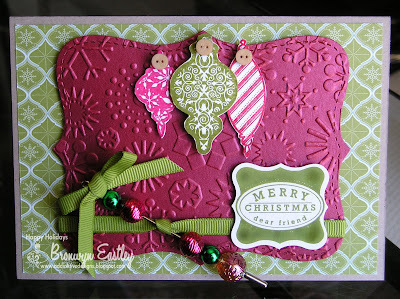 Love the embossed raspberry and the wonderful embellishments!! WOW! This is such a gorgeous card! I love all the detail - the buttons, the beads on the stick pin & the beautifully embossed paper! 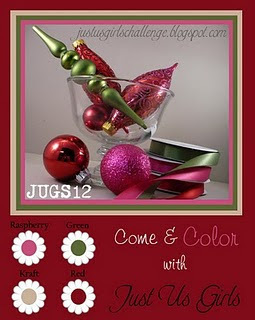 Great way to rock the Just Us Girls color challenge - Thank you for playing along this week! Hope to see you Saturday for an all new challenge! Very pretty! Love the pin with the beads...such a nice addition to this beauty! Thanks for playing our JUGs challenge!